This song poured out from my mouth when I am taking a walk these days. Yes, the spring is here at last !! The wild flowers show their tiny faces shyly above the ground . The plum blossoms are fully blooming. I don't need any other things other than spring ! though a kind of guilt and sympathy to those who can't reach to this freedom always creep into my mind. It is the "Shunbun" / spring equinox day tomorrow, and also is now in the midst of "Ohigan" in Japan. "Ohigan" lasts 7 days starting three days before the spring eqinox day (or autumn equinox day ) and ending three days after that. Some people visit the grave to pray for the ancesters and clean up the area. 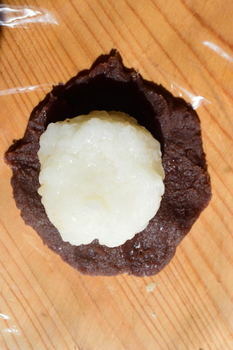 Some do not, but eat "Botamochi" or "Ohagi" . Some do not practice anything, but remember that the day time will be longer soon. Most of the Japanese people do no know why they visit the grave on "Ohigan" and eat "Botamochi/ Ohagi" during this period. It is considered that the heaven or the world for the deceased exists in the west, and this actual living world exists in the east. Therefore the day that sun rises from the very east and sets into the very west is the best day to connect the living and deceased. "Botamochi/Ohagi" is made of glutinous rice and sweet red beans. The combination of rice and red beans had so much meaning since old days. In fact, modern nutritional study revealed that it has a big nutritious value in those combination. Japanese people in older days knew it from their experience. Actually "Botamochi " and "Ohagi" refer to the same thing. 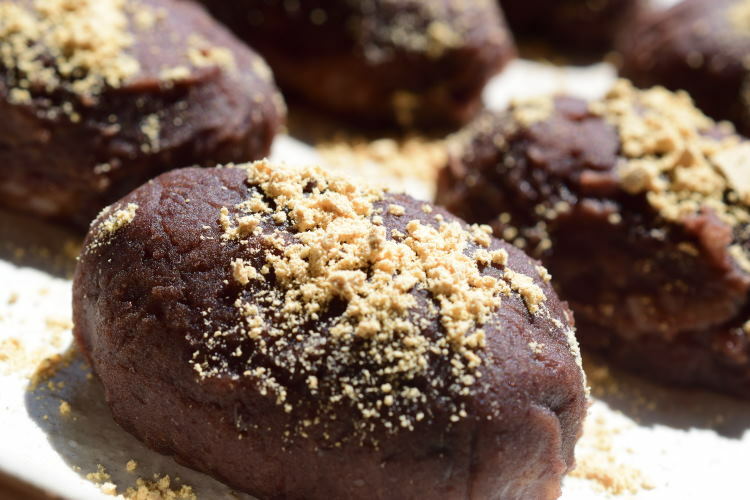 This sweet cake is called "Botamochi" in the spring, and "Ohagi" in the fall. In the spring, the flower of Botan blooms, and in the fall, the one of Hagi blooms. 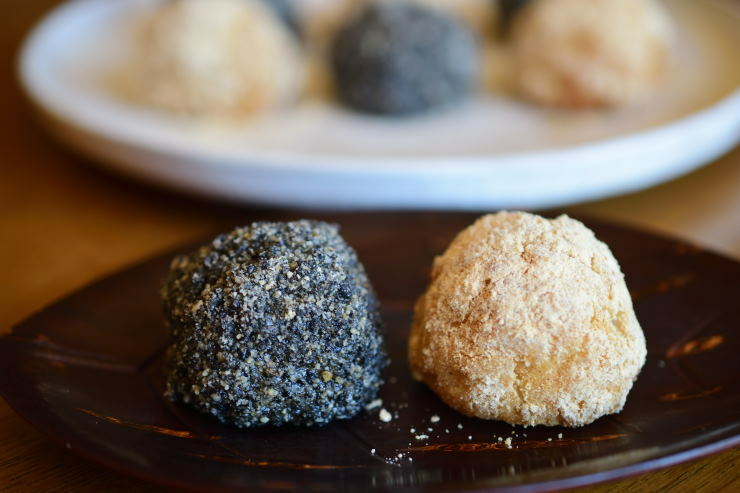 But usually people in Kanto area use the word, "Ohagi" for both spring and fall season ones. 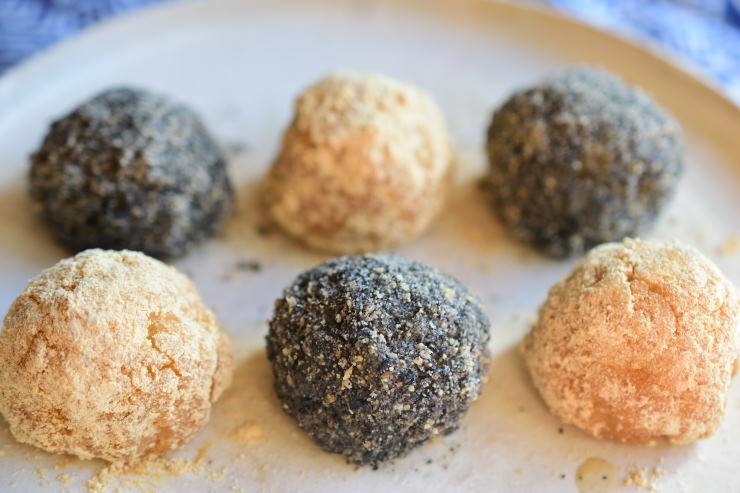 Whenever the spring equinox day or autumn equinox day approaches, I feel like eating Ohagi and cook it for myself . I am sharing a recipe of three color "Botamochi/Ohagi" of different flavors today. 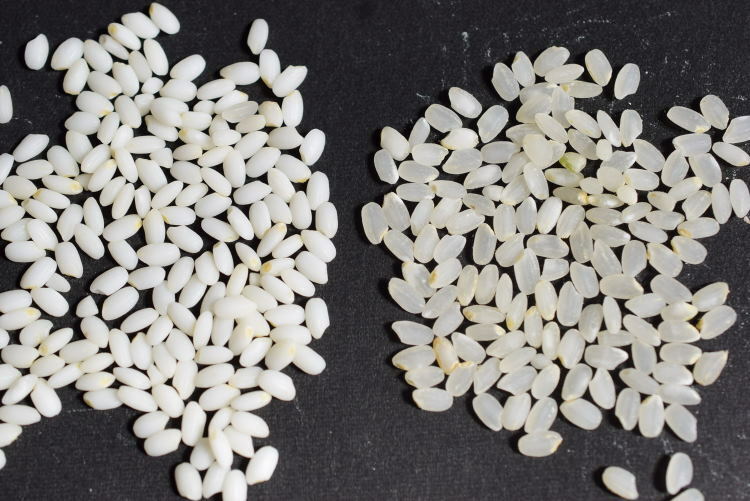 Which do you think is the glutinous rice left or right ? 2. 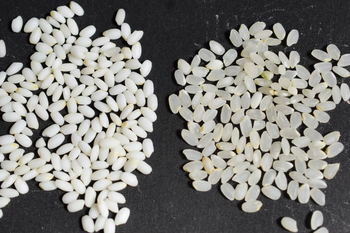 Drain rice using sieve, and then transfer to the pot. If you use the electric rice cooker, follow its graduated marks on the inside of the rice cooker. 3. If you cook in a normal pot, add 220ml of water, and cook for 5 minutes over low heat. 4. Increase the heat to medium. Once it reaches the boiling point, let it boil for a few minutes. 5. Reduce the heat to low, and cover with the lid. Cook for 20 minutes. 6. Turn off the heat and let it sit for 15 minutes before opening the lid. 7. 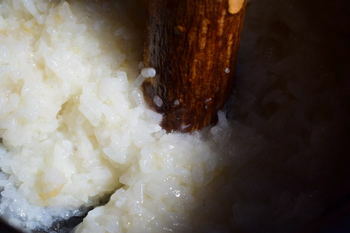 Mash the rice using the pestle. 7. 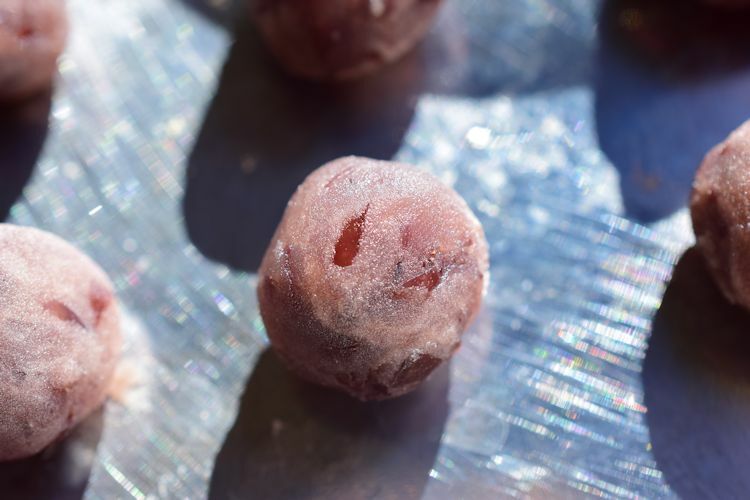 Devide into 15 portions (one should weigh about 20g) and shape into balls. 1. 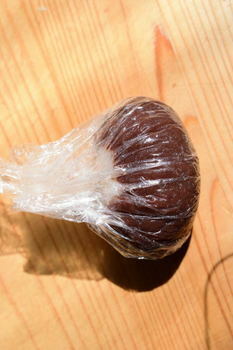 Place the prepared red bean ball on the plastic wrap, and spread to 7cm diameter round shape. 2. Place a glutenous rice ball on the red bean paste, and wrap with the plastic wrap forming into a nice ball. 3. 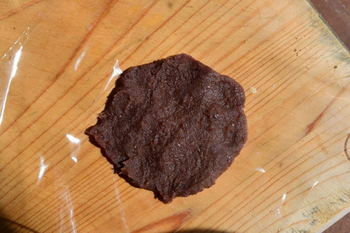 Open the wrap, and transfer onto the plate gently. 4. Repeat above procedure 4 times to make 5 cakes. 1. 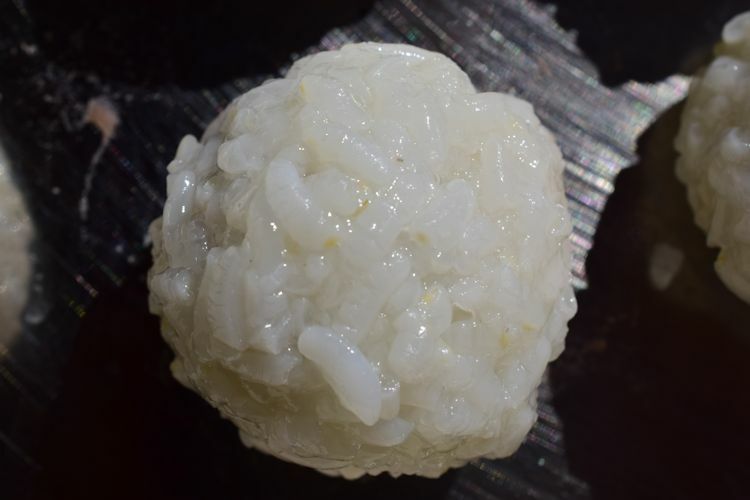 Wet your hand with water, and pread the rice ball into 7cm round shape on your palm. 2. 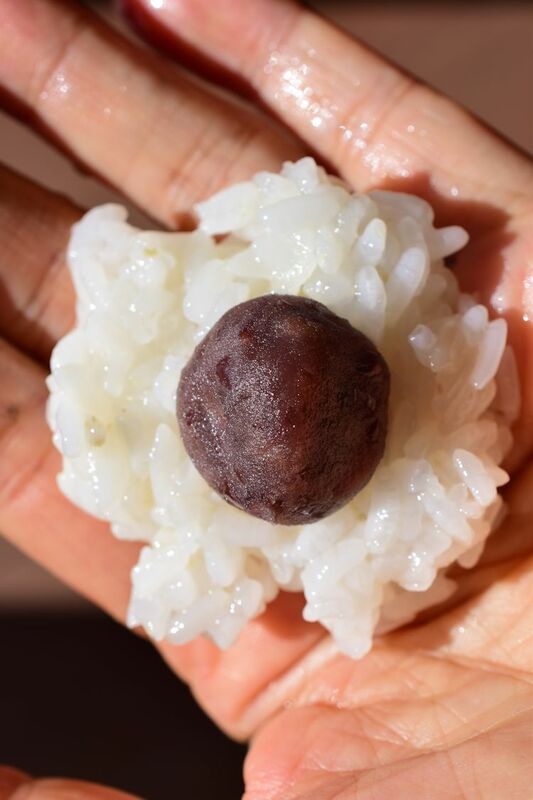 Place the red bean ball on the rice, and wrap with rice forming into a nice ball. Put them aside. 3. 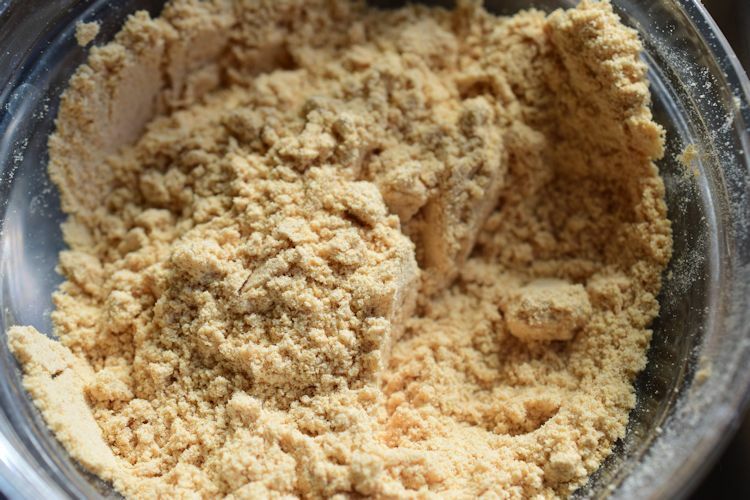 Mix the kinako, unrefined sugar and salt in a bowl. 4. 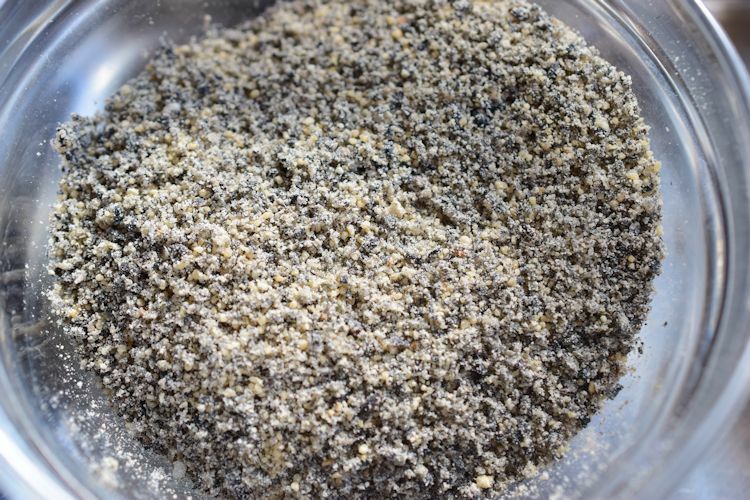 Mix the grinded black sesame seeds, refined sugar and salt in the separate bowl. 5. 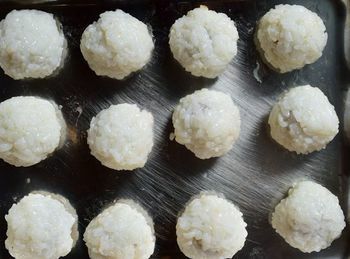 Place the rice ball into one of the bowls above, and coat wth the mixture. Repeat above procedure until you made 5 kinako cakes and 5 black sesame cakes. Put them aside for next 15~20 minutes. 6. Repeat the procedure of "5" and "6" twice more. This is because the rice cakes absorb those coatings, and they do no look yellow and black any more. By repeating coating procedure, the powder mixtures can stay around the rice balls making them look yellow and black. 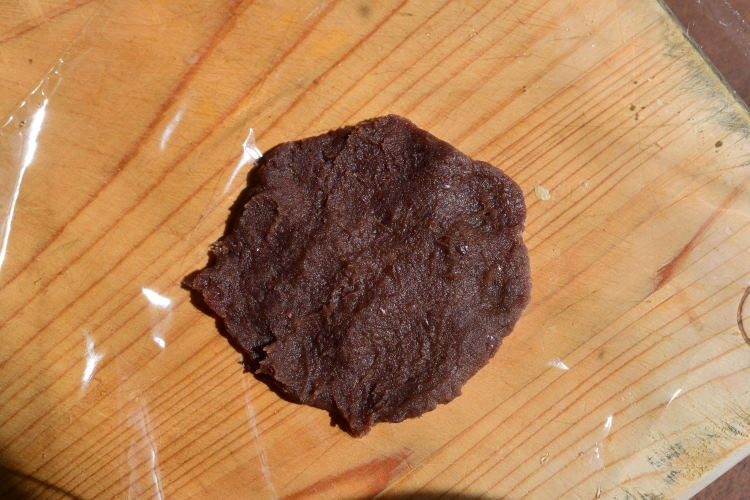 ＊　If you use ready made red bean paste, you probably want to reduce the amount of it as the one sold in shops are often too sweet containing much refined sugar. 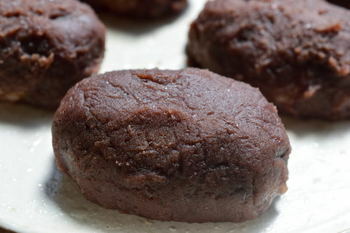 Refer to my previous posting for healthier sweet red bean paste making. ＊ Freshly toasted and grinded black sesame seeds make much nicer botamochi than ready made grinded one. 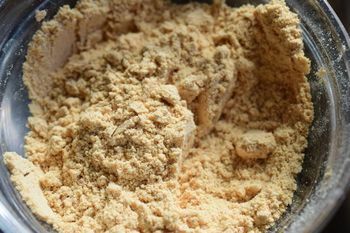 ＊ Making kinako/ roasted soy bean powder requires lots of labour and good mill. ( We need to roast the soy beans over low heat for some time before making them into the fine flour.) Therefore I purchase the ready made one. But need to make sure that it is fresh.